I have way too many of these things. I do not collect telescopes. Converting an inexpensive digital camera to shoot Infrared. for testing old cameras and light meters. Everything I know and more about a darkroom's biggest toy. A look at my personal library. Instruction manuals and brochures for some cameras, darkroom equipment and light meters. Vintage ads I found amusing, informative, nostalgic or just plain odd. Probably the most arcane collection on the internet. A discussion of common darkroom items—tanks, chemicals, and accessories. Instructions and advice on developing B&W film. An introduction into large format photography written in Frequently Asked Questions format. A brief explanation of how film speed, shutter speed, aperture and white balance affect exposure. An old recipe for a leather treatment/preservative for classic cameras. Not for use on bellows. from Popular Mechanics's Photo Handbook, 1948 edition. Are Flash Exposure Tables Crazy? 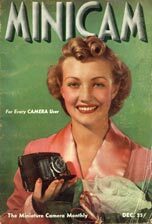 from a Minicam Photography article from 1941. Do You Know Your Flash Connectors? from a Modern Photography article from 1955. How Practical is the View-Master System? from a Modern Photography article from 1953.
timeless purchasing tips from the Photo Information Almanac 1982.